I thought I might be a family counselor. I loved the study of psychology, but I'm not a great listener. Then I got an advanced degree in education. I love kids, but reteaching the same history over and over got boring. So I went to law school. I like writing legal arguments and I like arguing in court, but the emotion of caring for my clients was too much. I just couldn't remove the feelings from my job. I spent my twenties and most of my thirties looking for something more. In addition, I took a legal job that consists of about 95% writing. I write memos, legal language for documents, and other technical writing. My friends talked me into doing Nanowrimo a few years ago. So far, I've written two romance novels and one young adult book. I'm still editing and looking for publishers, but the stories are on paper. At some point, I started blogging. My blog has become a great place for teaching people how to get organized and to manage their time effectively in a planner. I even write to answer the call in my soul to advocate for exceptional kids. One of my most popular non-planner posts is about parenting an exceptional kid. Somehow, my blogging hobby, my relaxing time, and my work became all about writing. It's easy for me and makes me really happy, so I am content as a writer. I want to remind my fellow bloggers that YOU are writers, too! Don't let people tell you it's "just a hobby." Own your identity! Writing is what I do these days. Writing, editing, and promoting my writing has become my life. Maybe I would have saved myself some angst if I had majored in English years ago. But I wonder if I would have become a writer if it felt like work? Would writing papers every week deadened my enthusiasm? Want to always read my writing and never want to miss a post again? 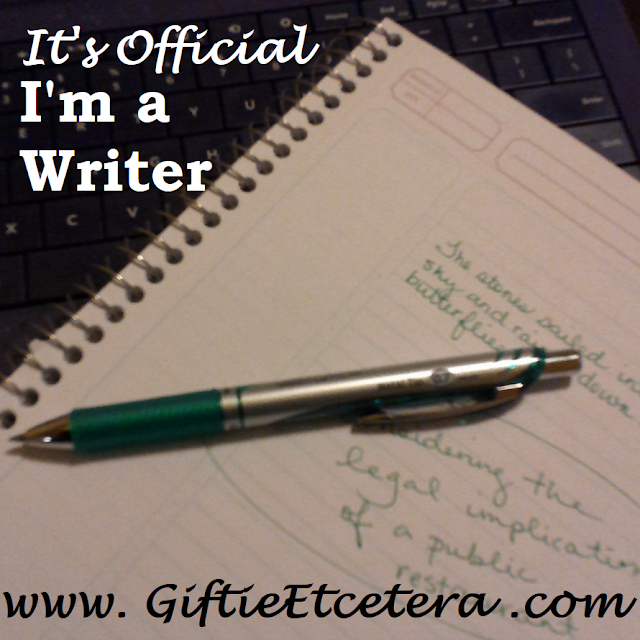 Subscribe to Giftie Etcetera via email (in the right gutter, scroll down a couple of inches). The only education I have was to be a bookkeeper. I am. But I'm also a published author and a long time (but not very consistent) blogger. I wonder if majoring in English (or Dutch in my case) would have made any difference. For me it even might have stopped me from trying to get published, since I would have been trained to look at text from a different point of view. (side note: we don't use agents here, I think sending stuff directly to publishers is not recommended in the US). I've done NaNoWriMo several times and "won" a few, but I too need to edit to get them in shape. Love that you are claiming, "I am a writer." I have a blog, my second one, and I never thought of myself as a writer when doing my first one, but with this one...I am a writer. It feels great to say it. Thanks. This is great! How awesome that you found a job that allowed you to indulge your love of writing without having to completely change career paths. Similar to you, I discovered I am a writer somewhat recently. I've always been writing, I just never realized how good for my soul it is. I also let rejection and criticisms hit me too hard. I've become more comfortable with calling myself a writer in the past year. Hello! I'm one of the co-host from Tuesday Talk. I've been blogging for 9 months and I never thought in my wildest dreams it would become all it has in a few short months. Mostly, I've discovered I actually enjoy it so much that when I'm not writing, I crave it. Sounds strange. Well, it has become something I am contemplating doing more of in the future, maybe on a different platform. Thanks for sharing this today with our readers. Do you bake too? Our Cookie Swap is next week, would love for you to join us. I've been blogging for a bit over a year now, but still can't bring myself to say that I'm a writer. Someday, maybe I need to get organized and start working on a book. . . I did major in writing although always have had an interest in writing off and on. I love blogging and the opportunity it gives me to write whatever is on my mind and in my heart. Ever since I started my blog, over 4 years ago, I've discovered that I LOVE to write, as well as investing in a good camera and taking up photography. It's amazing how my blog has brought forth my hidden talents. I recently wrote something for BlogHer, which they shared. That in itself, totally amazed me. Anyways, I'm here from My Flagstaff Home and wanted to say I wish you all the best in writing your books and getting them published! I'm actually educated to be a music teacher. (Funny timing, I wrote about that just yesterday ( http://www.mediumsizedfamily.com/so-when-are-you-going-back-to-work/ if you want to read it). My English classes throughout my education were always my favorites. If I hadn't gone the music teacher route, I bet that would have been my major. But I agree, it probably wouldn't be as enjoyable if I saw it as work! I've found myself wishing I had more Education to help me with my writing, but I like what you said, it may feel like work if that were the case. Great post, keep on writing and keep on owning it! Lovely! Just had to say that I'm really impressed by anyone who has accomplished NaNo, not just once, but multiple times! Way to go! I love your story and find some similarities to mine. I was trained as an accountant/auditor and did that for 15 years before I gave it up to be a SAHM. My passion for my job and doing what was right actually stressed me out and caused me physical pain so I left it. I'd started blogging in 2011 on a blogspot to cope with the stress of my life and never knew how much my blog would become a part of me. I never was a reader or a writer as a kid, I was always more science/math inclined. It's refreshing to use blogging as my creative outlet. Thanks for sharing your journey with us! I did NaBloPoMo last year and am doing Sit Down Write this year (which is based on NaNoWriMo) but I'm not doing a word count, just trying to make sure I work 30 minutes on my blog a day whether the post goes live or not. Long story short, Congrats on being a Featured Blogger for Small Victories Sunday Linkup. Pinning to our linkup board and hope you join us again this weekend.